How to produce great graphics in Adobe Photoshop. One of the first things you encounter when you start using Photoshop is its toolbox. You use the toolbox to access all of Photoshop’s tools, letting you do anything from moving stuff around through to painting, filling with colour, creating text, and lots more. The toolbox contains 28 icons and around 60 tools, and it can seem bewildering if you’re not used to it. Never fear — it all starts to make sense once you get to know your way around the various tools, and understand how they’re grouped together. This tutorial gets you up to speed with the Photoshop toolbox, and each of the tools it contains. By the time you’ve finished reading it, you’ll be well on your way to working proficiently with the Photoshop toolbox, and you’ll have a good general understanding of all the tools in Photoshop too. Smart Filters, first introduced in Photoshop CS3, let you apply any of Photoshop’s filter effects to a layer non-destructively. This means that — unlike a regular filter — a Smart Filter doesn’t permanently alter the pixels in a layer. Toggle a Smart Filter on or off. Unlike a regular filter, where the effect is permanently applied, you can reverse the effect of a Smart Filter by just turning it off, or deleting it altogether. You can also easily compare an image with and without the filter effect by toggling the filter. Go back and edit a Smart Filter’s settings at any time. Smart filters are totally re-editable. Want to make a Gaussian Blur effect more prominent after you’ve applied it? Just double-click the Smart Filter and increase its Radius value. Easily mask off parts of a Smart Filter. This is my favourite Smart Filters feature. Each layer comes with its own filter mask, letting you selectively hide parts of a filter’s effect in the image by painting on the mask. Apply blending options to Smart Filters. Just as with layers, you can give each Smart Filter its own blend mode and tweak its opacity. In this tutorial you’ll learn how to do all of these things with Photoshop’s wonderful Smart Filters. Let’s get going! 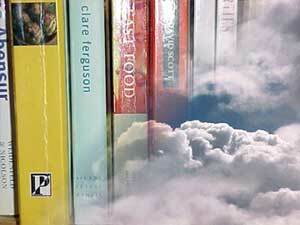 In effect, a Smart Object is like having a separate Photoshop or Illustrator document encapsulated in a layer. Smart Objects sit in the Layers panel just like regular layers. In fact, you can treat a Smart Object much like a bitmap layer — for example, you can move it, resize it, apply layer effects to it, and so on. When you want to edit the Smart Object’s original content, you just double-click the Smart Object’s thumbnail to open the embedded “document”, make your changes to the document in a separate window, and save. The Smart Object then updates to reflect your edits. Watch the video above to see what Content-Aware Fill can do. Removing the bits of trash and the tree is impressive enough, but wait till you see the road being removed at 3:53, and the extra sky and clouds appearing at 4:44! To paraphrase Arthur C Clarke, this technology is so advanced it’s almost like magic. Okay, you’ve gotten over the initial “wow” factor and managed to close your mouth again. How does this tool work exactly? From shape layers and adjustment layers through to layer comps, Smart Objects and layer masks, there’s a lot more to Photoshop layers than meets the eye. To really get the most out of Photoshop, you need to know these features inside-out, and that’s where the Photoshop CS3 Layers Bible comes in. 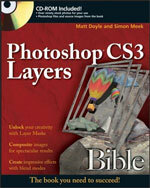 Written by Matt and Simon, ELATED’s in-house Photoshop experts, this book covers everything you need to know about layer techniques in Photoshop. The book is published by Wiley, and is available online from Amazon.com and Amazon.co.uk , as well as from all good book stores worldwide. To whet your appetite, here’s a chapter-by-chapter summary of what you’ll learn when you read the book. Of course, to edit and manipulate a layer, you need to select it. Sometimes you want to select more than one layer at once. And sometimes, if your document has lots of layers, you want to select a layer quickly by clicking it in the document window. This tutorial walks you through all these techniques, and more, and explores the myriad ways of selecting layers in Photoshop. If you’re a professional Web designer, chances are that you’ve used Photoshop at least once in your life. This impressive application, nearly 20 years old, is very much the industry standard for image editing and photo retouching, and is often the software of choice for the Web designer too. The latest incarnation – Photoshop 10, or CS3 – is just around the corner; Adobe officially launched it last week, and it’s currently available for pre-order at the time of writing. I’ve been playing with the CS3 beta for the last few months, and it’s certainly an impressive beast. Let’s take a look at the new, fun stuff that Adobe have added to their latest release, as well as areas that they’ve improved over CS2 and earlier versions. Have you ever wanted to create an image that depicts two separate images fading into each other? This is a nice professional effect that’s easy to create using Photoshop’s Layer Masks. This tutorial shows you how it’s done. After creating and editing your paths in Photoshop, what can you do with them? There are lots of uses for paths. Let’s look at some of the more common uses here. Now you know how to create paths, we’ll take a look at how you can change your path after you’ve made it. This way you can alter the shape of your path and “fine-tune” those lines and curves until they’re just right!